See also Kirtling Cricks Part 1. I would like to thank the following for their help in obtaining information for this page: Leanne Watmuff, Library Technician Local Studies, Wentworth Shire Library; Jeanette Hope, River Junction Research; Peter Vail , Great Great Grandson of William Crick. The central theme of the oral history about my great grandfather, William Crick, that I had been told for many years, was that he ran wool barges along the Darling River between Wentworth and Bourke; that he had a stage coach run (it was always assumed to be between the same two towns); and that Cobb and Co moved in as a competitor, only to drop out because William could subsidise his coach travel with his wool barges. It would seem that much of this oral history is substantially well founded, but had collected a few embellishments and inaccuracies along the way. I should say, at the outset, that my research to date, such as it is, has not been as thorough as research should be. There are still many potential sources, mainly in the SA Government archives and SA Genealogy and Heraldry Society, that might well render further facts and clarifications. Maybe I’ll get to it one day, but, if not, hopefully someone else will. In addition to the oral history, I had come across references to William Crick in books dealing with the life of his more famous or notorious son, William Patrick Crick – more commonly known as W P Crick or Paddy Crick. These had usually only noted that William Crick has arrived from England and had settled in Truro in South Australia, before moving to Wentworth. He later moved to the Dubbo area, eventually ending up in Darlinghurst (Sydney), where he died. He is buried in Waverly cemetery. He married Margaret Mungovan, who obviously is my great grandmother. She also died in Sydney and is buried with William. In 2007, while on a day ride from Broken Hill (attending the Ghost Town Rally), I spotted a ‘Crick Park’ in Mendindee, a town on the Darling River. On the basis of believing that William ran wool barges along the Darling, I assumed it was named after him. I thought that he might have been well known because his barges had used the Mendindee port, which was a sizable staging port on the river in its day. On my first foray into researching this, I came into contact with a Mary Wilson, who lives in Broken Hill and had done a lot of research into the history of Menindee and the area around the ‘Great Darling Anabranch’. The Great Darling Anabranch flows from the Darling just south of Menindee and joins the Murray just after its junctions with the Darling. One of the sources that refers to William Crick in a couple of contexts is a book called ‘Bushmen of the Great Anabranch’. I learnt, at this stage, that William was more noted as a mail contractor and it was likely that his name was given to the park in that capacity. I’m still to delve further into that. It was Mary Wilson who put me onto ‘Bushmen of the Great Anabranch’ and William’s role as a mail contractor covering Menindee. My more recent stop-over in Wentworth (August 2009), as part of my Big Trip North, allowed me to dig up quite a bit more about William. This was as a result of a day’s research in the local library with the help of their chief local history expert. Crick, William. b. c 1824, Bkm Eng, arr 1857 Carnatic, occ farm labourer, rel C/E, m by 1857 Mary b. c 1827. Crick, William. d. After 1867, occ mail contractor, res Truro, rel R/C, m 3/2/1858 Adelaide, Margaret nee Mungovan. Ch John (1859- ), William Patrick (1862-1908), Jas Henry (1864- ). In less cryptic terms, the first entry says that William Crick was born around 1824 in Buckinghamshire, England (we would say UK now). He arrived in Australia in 1857 on a ship called ‘Carnatic’. His occupation was given as ‘farm labourer’. His religion was Church of England. By 1857, he had married Mary, who was born about 1827. The second entry says that William Crick died after 1867. His occupation was ‘mail contractor’. His place of residence was Truro (SA). His religion was Roman Catholic. He married Margaret Mungovan in Adelaide on 3 February 1858. His children were John (born 1859), William Patrick (1862-1908) and James Henry (born 1864). The shipping list for the Carnatic, which arrived at Port Adelaide (South Australia) on 24 January 1857, includes in the ‘family’ category: William Crick, aged 38, farm labourer, place of residence Buckinghamshire, married to Mary, aged 30. William's memorial card says he died on 27 January 1920, aged 88 years. His Death Certificate says that he died on 27 January 1920, aged 87 years. So, matching ages, the William Crick who was my great grandfather (and, I might add, the great great grandfather of my children; and the great great great grandfather of my grand children) was obviously the one who arrived on the Sibella. Peter Vail has discovered William was born on 25 November 1832. That means he was actually 87 when he died. (Perhaps the printer of the memorial card knew he was born in 1832 and simply subtracted 1832 from 1920 to get 88!) It also means he was 19 when he arrived in Australia, but probably was still 18 when he booked his passage, as the ship sailed only a couple of weeks after his 19th birthday. His death certificate says he was born in Kirtling, England; and that his father was a farm labourer, whose name was Thomas. Kirtling is in Cambridgeshire, which accords with Cambridge being listed as his place of residence on the Sibella shipping list. It also says he was 22 when he married Margaret Mungovan in Adelaide. Margaret’s death certificate says she was 25 at the time. On the basis of William’s age, that suggests they were married in 1854 or 1855. This also works if you count forward from his year of birth. However, the genealogy entry above gives a very specific date of 2 February 1858. Both certificates put the birth of their eldest child (John) at around 1860, which is consistent with the genealogy entry that gives 1859 as John's year of birth. The two death certificates coincide in listing all their living children: John, James, Elizabeth, Thomas, Ellen and Eva. William’s notes “one male deceased”. Margaret’s notes “one male [and] one female deceased”. The male is obviously William Patrick (WP Crick). Perhaps, Margaret had a child who died before she and William were married. I find it interesting that William made the long and undoubtedly daunting trip at the age of 19, with, presumably, little money, no education to speak of and an unknown future. He would have had to find work quickly to survive. From the information below, he would seem to have developed jobs and enterprises in a fairly short space of time. Another interesting fact from the Sibella shipping list is that he was accompanied by Thomas Crick, aged 20. He was William’s brother, who gets mentioned in the information below. We know something about his life and death. William was also accompanied by Charles Crick, who was the same age as William. Delving into the information freely available on the Internet, it would seem that Charles was a cousin. I wonder what their parents thoughts about them taking off to Australia at such young ages. Since they all came from farm labouring, including, at least, William’s and Thomas’ father, life would have been pretty tough and the future was bleak. I'm only a little way into researching this aspect, but it's already obvious that the plight of the farm labourer took a maked downturn in the later half of the 1700s and was at a nadir around the time of William's birth. Little wonder that the boys took an opportunity to get away, even if to the other side of the world. Post Script: This is December 2009. I have now done a liitle more research on William's origins and have created a new page the Kirtling Cricks to set out what I have found to date. It's all 'work in prgress'. But take a look if you're interested in looking further into the Crick ancestry. · Jack says that William Crick, whom he refers to as Bill, was the first man who drove mail on the Murray. Leaving Adelaide, his coach passed through Truro, then onto Blanchetown. Passing round the great nor’west bend, it called at Overland Corner and Bookmark, and so up river to Wentworth. · Jack is also recorded as saying that a pack horse carried the mail between Blanchetown and Wentworth. The letters and papers would only weigh a few pounds. At the Anabranch, the natives would put the mails across in one of their canoes, and Crick would swim his horses behind. The journey would take three and a half to four days; and Crick rode the track for between six and seven years. According to Jack, this was the very first mail service on the Murray. · Jack said that the second mail service was carried in a kind of half breed sulky, and George Raynor, one of the Lake Victoria stockmen, took the job on for Crick, who was still the contractor. Hugging the river all the way, Raynor drove from Wentworth to Overland Corner, where Harry Brand, crossing at Wrigley’s, would drive into Blanchetown. This service was maintained until Cobb and Co obtained the contract and came onto the road. · Cobb and Co held the road for six years, when Bill Crick got the contract again. Cobb and Co ran opposition coaches to Crick, but they only lasted some three months. The big firm became tired of the game and eventually pulled out, selling all their best horses to Crick. Jack was recorded as saying a lot about who drove what sectors between Blanchetown and Wentworth; but it’s not easy to work out over what periods precisely or under what arrangements. More delving into government records would be needed. It was to and from the Moorna PO at the Junction that mail was delivered and despatched. A plaque on a wall in the main street of Wentworth says “a shed on this site was named Wentworth Post Office on 30 June 1860. Prior to this date it had been known as Moorna.” This reflects the fact that by 1860, Wentworth (at the junction) had become the key location for business and settlers. The plaque also notes that “Andrew McClymont was Postmaster.” Withers’ book notes that Andrew McClymont became postmaster in 1857 (at the Moorna Post Office at the Junction). In the same paragraph in which Withers records these developments, she says that the mail from Adelaide was carried on horseback once a month by two brothers, Thomas and William Crick, who had been at Lake Victoria with George Melrose. She noted that Wentworth was growing rapidly then and about a hundred people were living around the nucleus of the Junction Inn. · Around 1857-58, William Crick was settled in Truro. · William would seem to have been involved in mail runs to and from the ‘Moorna PO’, while it was still called that, although physically located in Wentworth; and also after its name changed to Wentworth PO. · He was still engaged on the Adelaide-Wentworth route in 1870. · If, extrapolating from Jack Coombs’ recollections, Cobb and Co pulled out of competition with William Crick three months after he regained the contract, Wiliam’s getting the contract back must have been around February 1870. · If Cobb and Co had the contract for 6 years before William Crick got it back, he must have had it up until 1864. · Coombs also recollects that, under WiliamCrick’s first contract, he ran the road for six to seven years. That means he must have started about 1858. · It would seem more likely that the first contract of carrying mail between Adelaide and Wentworth was by pack horse. This accords with several of Coombs’ recollections and a statement in Withers’ book, notwithstanding Coombs’ also referring to ‘the coach‘ passing through Truro and Blanchetown, and up the river to Wentworth. I wondered if there wasn’t possibly a coach from Adelaide to Blanchetown, where William might have collected the mail for transport by pack hose to Wentworth. It’s hard to imagine that William would have had the capital to buy coaches too soon after his arrival in Australia as a farm labourer. That’ll need further investigation. · It might have been that Cobb and Co replaced William around 1864 because they proposed coach travel. After that, William might have set out to position himself to win back the contract in 1870. · But Coombs refers to other contractors around 1874. And the pioneer Conrick met Crick on a packhorse run from Wentworth to Wilcannia in 1873. So what happened to his coach contract and the horses he bought from Cobb and Co around 1870? · Then there’s the reference to Freeling. The only reference I came across to Freeling was in the South Australian Register quoted in Withers’ book reporting that Cobb and Co had ceased running on the route from Feeling to Wentworth. · It would have been around 1873 – and for however long William trekked north from Wentworth with mail – that he came to pass through Menindee. There are still some gaps in all this, at least, in my mind. If anyone reading this has some answers, I’d love to hear from them. William also got into wool transport along the Darling between Wentworth and Bourke. At least, I assume he did. I found references to his owning both a paddle steamer and a barge (only one of each). 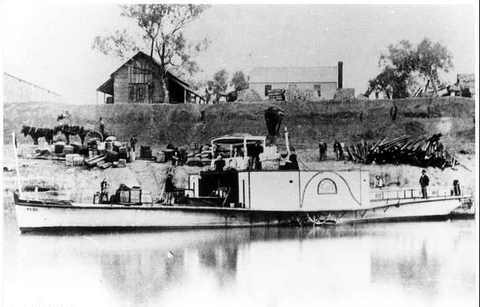 The paddle steamer was a small one of the size suitable for the shallower and unreliable Darling, as compared to the larger steamers that plied the Murray. I didn’t come across any specific references to wool, but I understand that the river trade was largely transporting wool down the Darling to Wentworth. I gather there were instances, when the river spilled its banks across the flood plains, that the small steamers could cross the plains and collect wool directly from the shearing sheds. There were other times when steamers and barges were stranded for months when the river dried up. Records indicate that William Crick bought a paddle steamer called PS Blanche in 1873 or 1874. He owned it in his own right for 2-3 years before then owning it in partnership with E Geyer. I was told that E Geyer was a prominent store owner in Wentworth with a large store in the main street. It would seem they sold the Blanche in 1877. 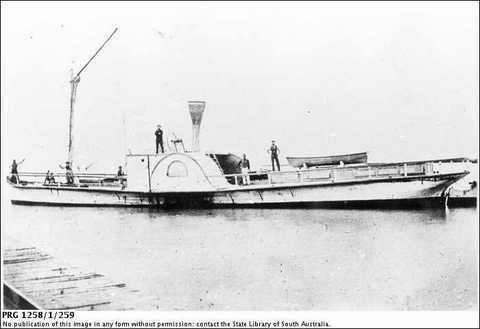 The PS Blanche was built in 1869 by Gordon and Wallace in Goolwa. The engine came from Goolwa Foundry. Its official number was 55603. It was broken up in 1909. There is also reference to William Crick, in partnership with E Geyer, owning the barge Morning Star. I didn’t come across any more details on this, but the steamer and barge quite possibly came as a package deal. If so, the ownership periods would coincide. There was a paper with a lot of information about the departures and arrivals of the PS Blanche. Unfortunately, the records don’t start until 1882, some five years after William Crick sold it. But they do provide an insight into the trips it did and its cargo from 1882 to 1887. From 1882 to 1883, it had a busy schedule between Wentworth and Morgan, with many departures recorded as “for the Darling” and arrivals “from the Darling.” There’s a record in 1885 having it arrive “from the Murrumbidgee.” There are references to it transporting wool “from the Darling.” There’s a reference in 1888 to a Mildura Cultivator, Mr P McLaren, purchasing a retired steamer –the Blanche. He caulked and patched her up and sailed her to Mildura. William’s ownership of the Blanche and Morning Star seems to have started around the same time he was transporting mail north from Wentworth to Wilcannia – and possibly as far as Bourke. Perhaps his ownership of the steamer and barge was an investment and he occupied himself with his mail contract. Perhaps he was over mail contracting by then. RC 22 August 2009, Wilpena. Revised 24 November 2009, Canberra.